The European Union is now making security-related information from satellite intelligence available using a software application named “GeohuB”. The tool was developed in the framework of the multi-level project “Geospatial Information to Support decision Making in Operations” (GISMO), launched in 2014. The agency responsible is the European Defence Agency (EDA). GeohuB is intended to facilitate geospatial intelligence. According to EDA, it covers “land, sea, airspace and cyber”. The European Union’s military missions have access to the application. Following a field trial last year, GeohuB was deployed to the EUNAVFOR MED military mission in the Mediterranean and its headquarters in Rome. All participants can generate and upload content, including images, geo-referenced imagery and “planning information”. GeohuB is accessible through a normal web browser. One EDA staff member thus compares it to the commercial application Instagram. GeohuB is now also used in other contexts, including the EU Monitoring Mission in Georgia and by the Portuguese military. The material accessible through GeohuB comes from the EU Satellite Centre (SatCen), which is based in Torrejón, Spain. The EU operates the Global Monitoring for Environment and Security programme, now renamed “Copernicus”, for which a total of six optical and radar-based satellites are being launched into space. They will then be followed by a new generation of high-resolution satellites, expected to be available around 2025. Raw data for Copernicus is purchased from commercial operators or provided by individual EU Member States. The new EU strategy on satellite communication (GOVSATCOM) enshrines the aim for greater synergies to be achieved between civil and military capabilities. According to a SatCen presentation, satellite intelligence is also used to provide humanitarian aid. The phenomena listed in the presentation include “refugee camps, state failure and insurgency, man-made and natural disasters”. The presentation includes a slide showing satellite imagery of the camps and “potential hiding places” of refugees in Morocco on the border to the Spanish exclave of Melilla. Based on the label, the image comes from an earth observation satellite operated by the American company DigitalGlobe. GeohuB is to be further improved before reaching its full operating capability in the first quarter of 2019. The EU Military Staff is also examining further use of the software. It could conceivably be used by the intelligence directorate EUMS INT, which, like the Defence Agency, is subordinate to the European External Action Service (EEAS). There is no confirmation of this, however. The European Union carried out a security research project named “Persistent Surveillance Long Term Analysis” (SULTAN) to improve the collection and processing of satellite imagery. The study explored how satellites and drones could be used for Imagery INTelligence (IMINT). The data obtained in this way could also be available to civil agencies such as Frontex. The border agency was also involved in SULTAN. Frontex now has a “tailored application” which probably also allows access to satellite imagery. 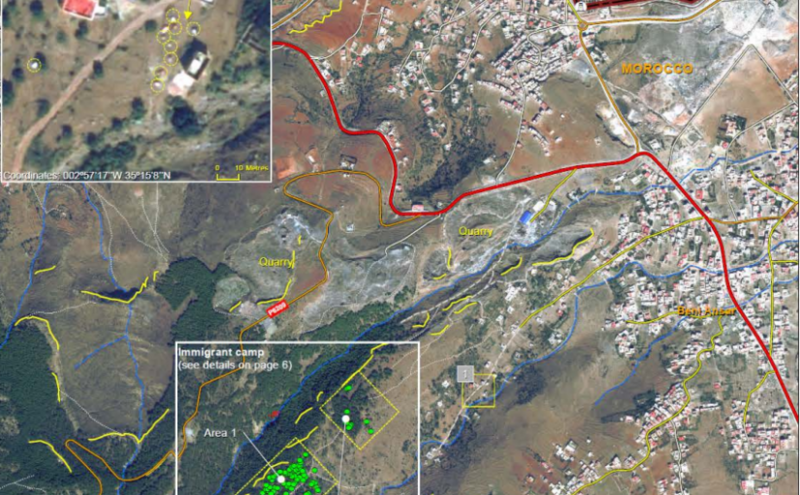 Image: Satellite intelligende to find “potential hiding places” of refugees in Morocco, near Ceuta (SatCen).